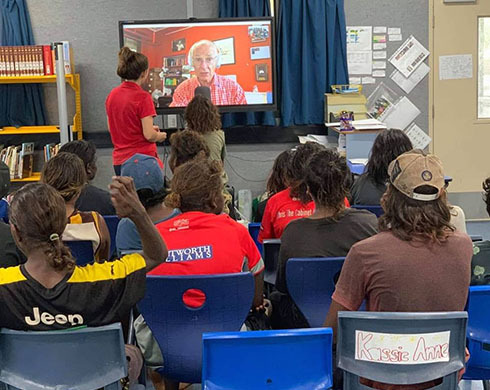 Jilkminggan School students were treated to a special STEM lesson when they Skyped world famous scientist and author, Dr Karl Kruszelnicki. Known colloquially as Dr Karl, the science popularist fielded questions ranging from the world’s deadliest animals, how cyclones form, the heat of the Sun, and the depth of the oceans. Principal of the Katherine region school, Scott Ryan, said that students were really excited to have the opportunity to chat with Dr Karl. “After a few technological issues it ended up being a really positive session, and the students were pumped to be doing something different,” he said. “At Jilkminggan we are always trying to show our students that there are a variety of opportunities and careers for them beyond the community. A small group of students will be visiting Sydney in July to visit Emanuel School, their sister school, and to meet Dr Karl personally.